Humorous books for young readers often do not encourage higher thinking and thoughtful discussion about complex themes. 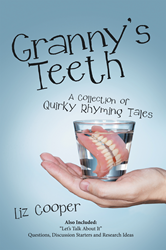 Author Liz Cooper, a former teacher and school system reading supervisor, seeks to do just that with her new book, “Granny’s Teeth,” a quirky collection of tales for children and adults. After the first tale in the book, titled “Francois and the Tide,” won a top-ten award as a standalone children’s book, friends, family and fellow writers encouraged Cooper to write more material; thus, she decided to compile more of her own short stories. The book also contains questions and activities to engage children’s minds and incite complex discussions. “Granny’s Teeth” is sure to entertain children and adults, as well as encourage development of critical thinking and reading skills. To learn more please visit LizCooperAuthor.com. Liz Cooper has a Master’s Degree in Reading from Towson University. Drawing upon her former experience as a teacher and school system reading supervisor, she knows how to write stories that are charming, thought-provoking—and downright funny.